You can’t rely on your bike for everyday travel if you don’t have a way to keep it in good condition. Unfortunately, most residents of our region live in a bike shop desert where there are few if any nearby bike shops. 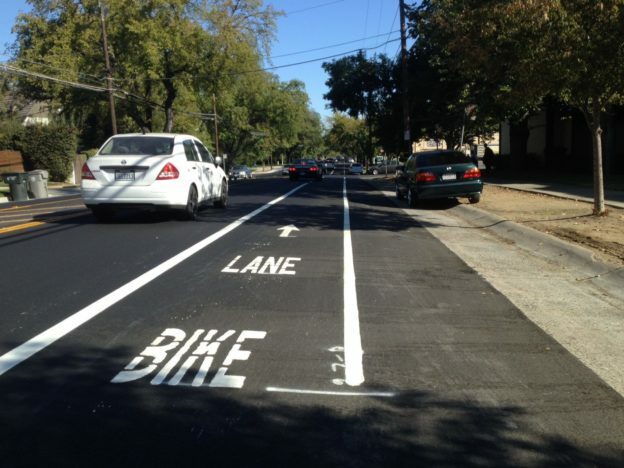 Sacramento’s first protected bikeways (also sometimes called protected bike lanes, cycle tracks or separated bikeways) are being installed on three downtown streets and we’re hearing a lot of questions. This is the second of several blog posts where we’ll explain more about this kind of bike infrastructure. 1. They’re the first ones in Sacramento, but not in the region. There’s a protected bikeway in Davis on J Street near Drexel Drive, and in West Sacramento on Linden Road, west of Jefferson Blvd. More are planned for Sacramento and also in Rancho Cordova. As of 2016 there were 292 streets with protected bikeways in 82 North American cities. Sacramento is actually somewhat late to this particular party. Read more here about the inventory of protected bikeways in North America. 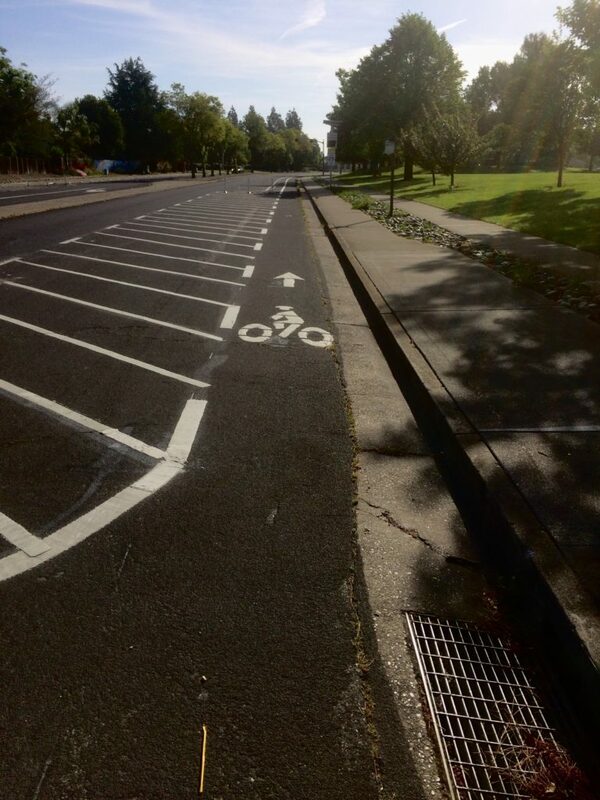 Protected bikeway on Linden Road in West Sacramento. 2. The location on the left side of P and Q streets is one of the standard designs. Two features make a protected bikeway “protected”: a painted buffer at least 2 to 3 feet wide and a vertical element such as a flexible bollard, median, planter or a row of parked cars. Protected bikeways are almost always placed against the curb. They can be one-way or two-way and can be placed on the right side or left side. 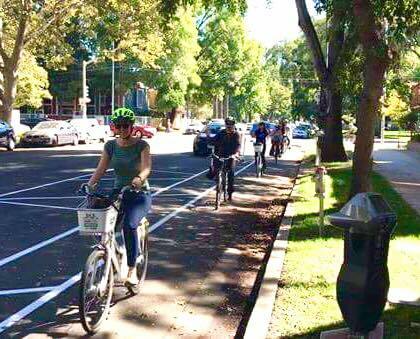 Sacramento’s new protected bikeways were designed according to Caltrans standards, which provide for flexibility to accommodate the characteristics of a specific street – for example, not all streets are the same width. The City of Sacramento located the bikeway on the left side of P Street because of the high number of public transit and commuter buses with loading areas on the right side of the street, especially west of 14th Street. While there are design options for protected bikeways that wrap behind bus stops, they only work where there is enough road width. P Street wasn’t wide enough and widening it wasn’t an option. On Q Street the left-hand bikeway keeps bike traffic separate from the large volume of eastbound vehicle traffic that turns right onto 15th St. The protected bikeway on 10th Street between L and I streets is located on the right side of the street. Read more here about the various kinds of protected bikeways. 3. The new parking lanes provide for increased visibility at intersections. The project increases sight distances at streets that cross P and Q streets by removing one or more spaces from near each intersection. The shorter parking lanes on P and Q make people on bikes (as well as pedestrians) more visible to drivers. P Street looking east from 13th Street. Parking spaces removed from the end of each block make bikes more visible to drivers. For drivers waiting to cross north at P Street or south at Q Street, the approaching bike traffic is now visible for the entire length of the block – much more visible than where the bike lane is placed on the outside of the parking lane. This design happens to be the oldest kind installed in the U.S. 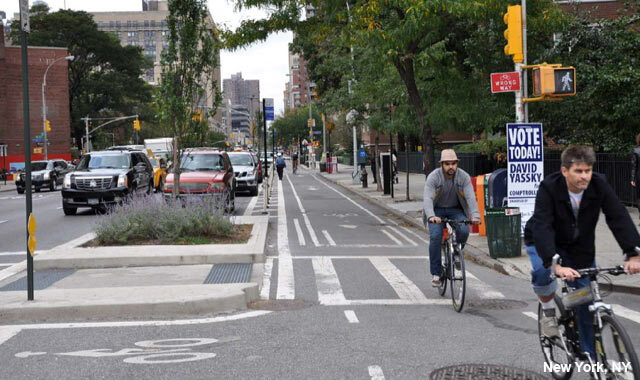 The first two protected bikeways in the U.S. were installed on 8th Ave. and 9th Ave. in Manhattan. Both are on the left side of one-way streets and buffered by parked cars. 9th Ave protected bikeway in New York City, one of the first two protected bikeways installed in the U.S.
4. Green paint will highlight specific points of conflict. Where the protected bike lanes cross entrances to 8 parking lots, garages and alleys on P and 10th streets, those entrances will be painted bright green to signal to drivers and people on bikes to use extra caution, as recommended in Federal Highway Administration standards. You can already see green paint used this way on Carlson Drive at H and J streets. 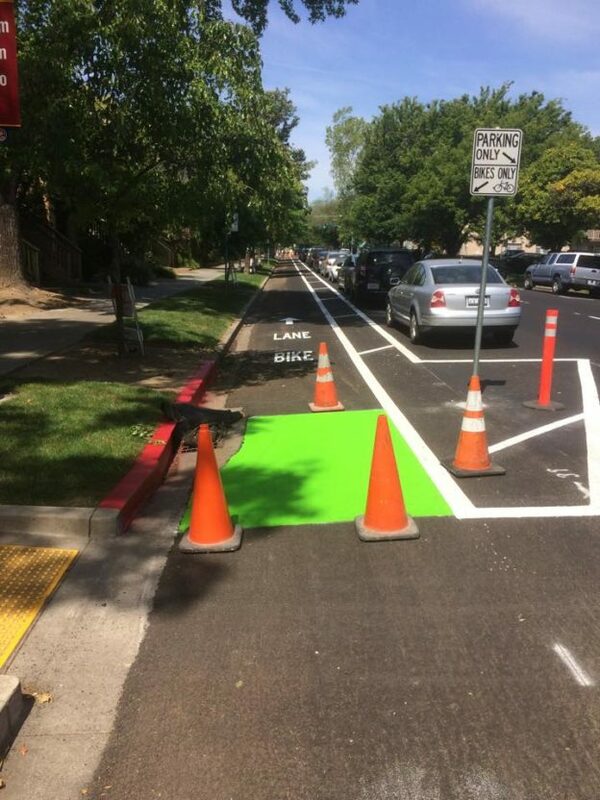 Continuous green bike lanes are generally no longer installed, due to high maintenance costs. 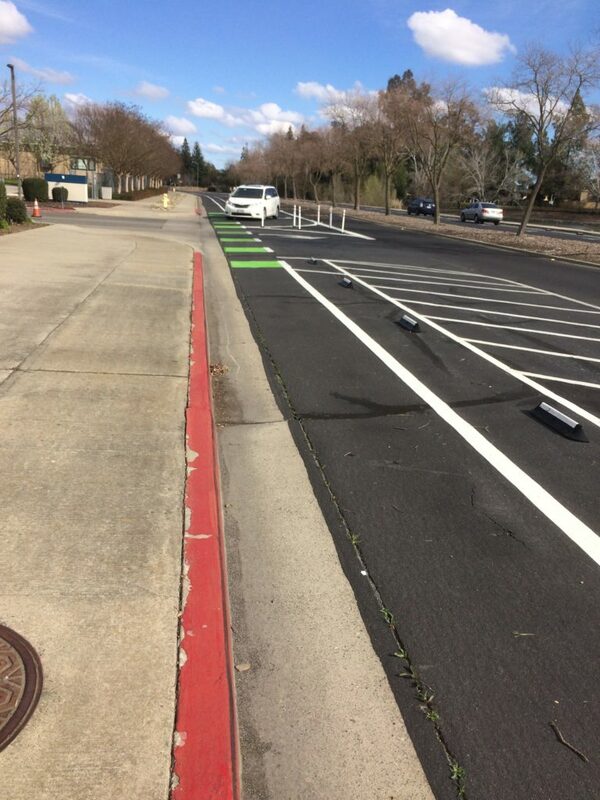 Green paint marks the place where the bikeway crosses the entrance to Southport Elementary School on Linden Road in West Sacramento. 5. The new bikeways will improve safety but won’t completely eliminate hazards. Creating more separation between bikes and cars on busy streets reduces the potential for conflicts. That’s what protected bikeways are designed for. New York City’s protected bike lane on 9th Avenue led to a 56 percent reduction in injuries to all street users, including a 57 percent reduction in injuries to people on bikes and a 29 percent reduction in injuries to people walking, as well as an 84 percent reduction in sidewalk riding. 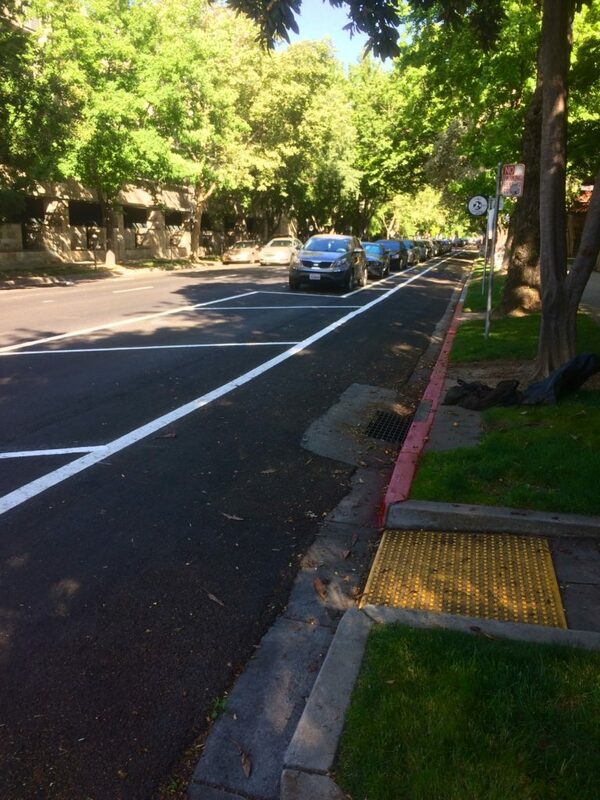 A traffic lane on each street has been removed on 10th, P and Q streets to accommodate the new bikeways. This so-called “road diet” slightly increases vehicle congestion, which has the effect of reducing speeds. But it doesn’t completely eliminate potential conflicts at an intersection with a two-way stop (i.e., for cross traffic only) or at alleys. For example, there are no stops for traffic heading west on P St. at 14th, 13th and 11th streets. Vehicles can freely turn left or right. Where cars turn left, they cross the left-side bike lane without having to stop. This hazard currently exists on all one-way, two-lane streets with a conventional bike lane on one or both sides and no controls at cross streets, including portions of 5th, 9th, 10th, 19th, 21st, G, H, N, P and Q. Creating more four-way intersections with stop signs and traffic signals can help reduce this hazard, although that’s an expensive option – one 4-way traffic signal costs about $1M. And even then, these kinds of collisions also occur at intersections with 4-way traffic controls. The protected bikeway project reduces this hazard two ways: the road diet helps calm traffic speeds, giving drivers and bicyclists more reaction time, including drivers making right or left turns, and the removal of parking spaces at the intersections makes bicyclists more visible to turning drivers. This entry was posted in Blog on May 7, 2018 by SABA. This Thursday, 587 local nonprofits will take part in the Big Day of Giving, the annual 24-hour online giving challenge. 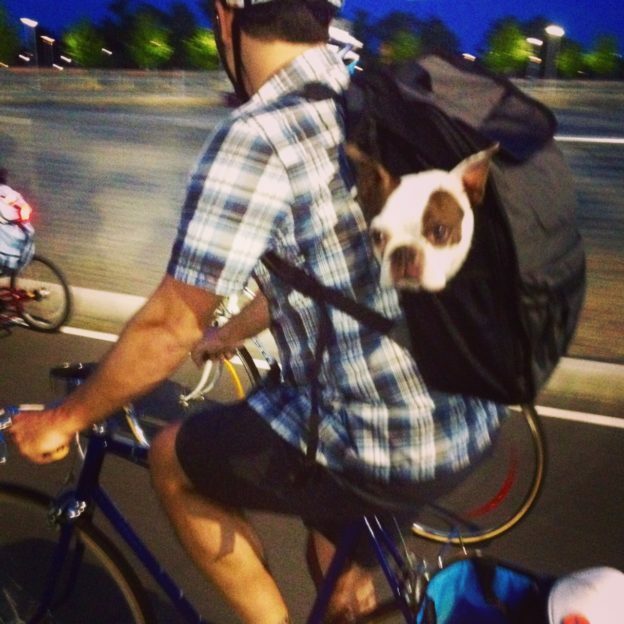 In case you’re wondering, we’re the only participating nonprofit devoted to the interests of people on bikes. Please consider making a generous donation to help us continue fighting the good fight for better bike infrastructure, less traffic and cleaner air. Any donation we receive between April 14 and May 3 counts toward our Big DoG fundraising goal of $12,000. You have options! Your donation made here will be processed by the Sacramento Community Regional Foundation on SABA’s behalf. If you donate right now, your gift will be counted as a pledge to be processed early on May 3 – convenient if you’re busy on Thursday. You can donate right now using this PayPal link. You don’t need a PayPal account to use this option – you can use your bank card too. Call our office at 916-444-6600. We can take your card information over the phone and process the donation immediately. We’re located at 909 12th Street, near I street. Drop off your donation (by check, card, even cash) and get a thank you in person! On Thursday, we’re co-hosting a Big DoG happy-hour open house from 3-6 PM with our neighbors. Stop by with a donation — and even if you’ve already donated — and enjoy some snacks and good company. BONUS: Golden 1 Credit Union will match up to $50,000 in donations from members who use their Golden 1 credit or debit cards to donate. Donations made early on May 3 stand a better chance of being matched. Pledge now and you’re donation will be processed just after midnight on May 3. And if you’ve already pledged or donated, thank you! This entry was posted in Blog on May 1, 2018 by SABA. Sacramento’s first protected bikeways (also sometimes called protected bike lanes, cycle tracks or separated bikeways) are being installed on three downtown streets and we’re hearing a lot of questions. This is the first of several blog posts where we’ll explain more about this kind of bike infrastructure. May 1 is the start of our region’s annual month-long celebration of all things bicycle, with rides, classes, events and promotions meant to encourage more people to choose a bike for everyday travel. Public agencies like to use this month to unveil new improvements and programs that support bicycle transportation. For example, in a few weeks the City of Sacramento will open 20 blocks of buffered and protected bike lanes (AKA separated bikeways or cycle tracks) on three downtown streets. Many people who already ride a bike recognize the benefits and feel validated by such improvements. Yet the real beneficiaries aren’t even on a bike yet. For every person currently riding a bike, there are as many as five drivers who say they want to ride a bike for transportation but won’t do it on streets where they have to ride with traffic. These interested but concerned would-be cyclists are waiting for less stressful conditions – off-street paths and bike lanes comfortably separated from moving vehicles. 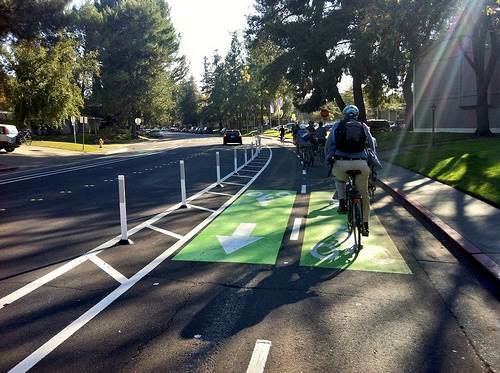 Six years ago researchers working with San Jose State’s Mineta Transportation Institute published a groundbreaking methodology for creating continuous, low-stress bikeways meant to accommodate the interested but concerned cyclist. By sorting streets according to their level of “traffic stress” — based on factors such as size, vehicle speed and traffic volumes — it’s possible to identify those that are naturally calm and those that need to be tamed. Potential networks, including gaps to be filled, reveal themselves easily. Their research changed the way cities think about bikeway networks and how to design for all ages and abilities. Low-stress bikeways became the gold standard in bikeway design. Dutch-style designs, such as buffered and protected bike lanes, became potent tools for reducing the level of traffic stress on streets that are challenging for people on bikes. Stockton Blvd. looking north from Fruitridge Road. Anyone who regularly travels by bike in our region encounters big disconnects: the bike lanes that just end, the white-knuckle ride on the busy streets and boulevards that clearly weren’t designed for people on bikes. Imagine a trip by bike without those gaps and without facing a limited number of poor options for traveling safely. That’s what you get with a low-traffic-stress bikeway network. Now do the math. If we created bikeways that enabled even 20% of the interested but concerned to choose a bike over driving, we would immediately double the number of people traveling by bikes, with a corresponding drop in traffic and thus air pollution related to transportation. An increase in bike traffic also means fewer traffic deaths and injuries of all kinds. Sounds like a dream? 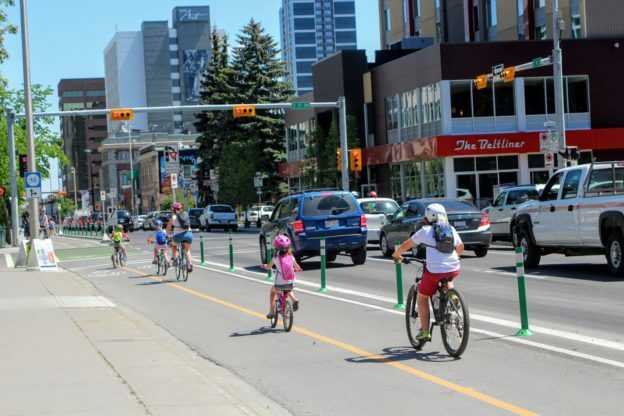 The Canadian city of Calgary installed nearly 3 miles of protected bike lanes in its downtown grid and within the first three months saw a 95% increase in the number of bicyclists on those streets compared to the year before. A study released last year in Seattle showed the highest rates of bicycling near the calmest facilities, including bike paths and protected bike lanes. 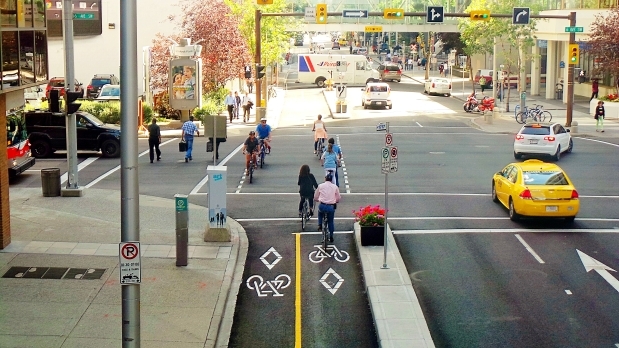 Two-way protected bike lane in Calgary, Alberta, Canada. As you ride around our region this month, look around and ask yourself who you don’t see riding there. They’re the ones we’re building for. Support our work to enable more people to choose to a bike as safe, convenient everyday transportation with a generous donation on Thursday, May 3, the Big Day of Giving. This entry was posted in Blog on April 30, 2018 by SABA. For once, it’s not just about bikes. 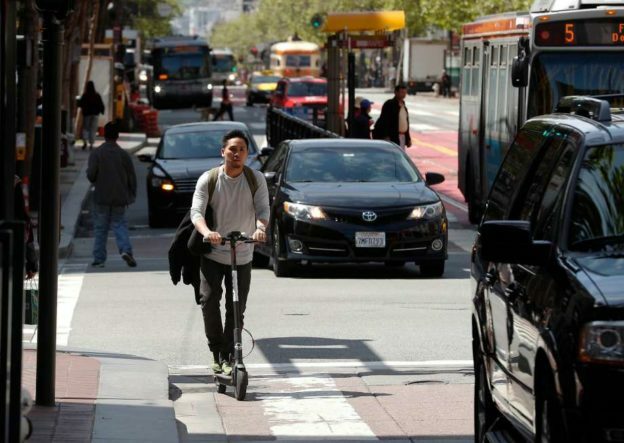 The latest disruptions in the shared mobility revolution hit the headlines this week, with Slate, Wired and other major news outlets reporting on the pushback against the largely unregulated deployment of shared electric scooters in San Francisco. 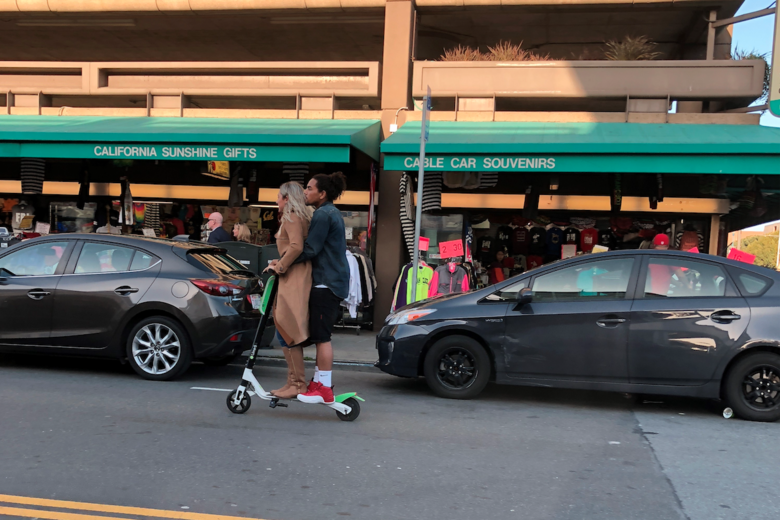 The City Attorney there has issued a cease and desist order against Bird, LimeBike and Spin while the Board of Supervisors decides how to regulate them. For bike advocates, this story is familiar — bike share systems are controversial — and more complicated than it may seem. Scooter share could help people get out of their cars, and that would be good for people on bikes. But that hasn’t been the case so far with Uber and Lyft – they’re putting more cars on the street while luring customers away from public transit. It’s possible scooter share won’t attract drivers but instead attract people who don’t want to wait for the bus. 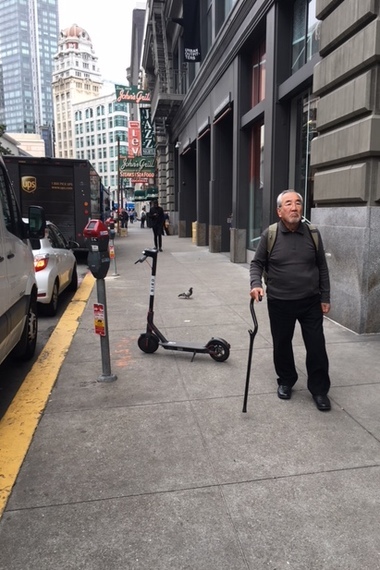 The conflicts created for pedestrians when share scooters are parked and ridden on sidewalks (riding them on sidewalks is illegal in California) put pressure on cities to provide bike lanes and quieter streets where they can be legally ridden. That’s hardly a bad thing for people on bikes. We definitely need more bike lanes, especially protected bike lanes. And anyway, if bicycling continues to boom, they’ll be busier. How much does it matter if we share them with e-scooters too? When that pressure comes from the business community and companies like Bird, LimeBike and Spin, that’s also a good thing. Providing for more and better transportation options should be everyone’s business, and not just what organizations like SABA talk about. But should local government be expected to pay for the infrastructure where companies like Bird, LimeBike and Spin run their business and, presumably, make their fortunes? Airlines pay fees that help cover the cost of building and maintaining publicly owned airports. 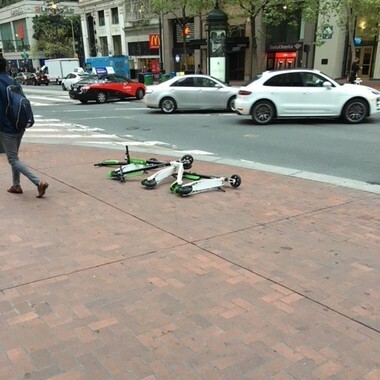 What should we be asking from Bird, LimeBike and their competitors – especially when they operate (or prefer to operate) without any regulation, including payment of permit fees? This was the crux of the debate over AirBnB a few years back. The endgame for companies like Bird, LimeBike and Spin –- or rather, for the venture capitalists who fund them — is autonomous vehicles. By deploying shared bikes and scooters, these companies are getting a feel for their customers, testing the user interface and learning how to navigate the regulatory landscape. So don’t be surprised if you see LimeBike turn away from bike share entirely (we’ve been hearing that rumor) while the business model continues to morph. For those of us devoted to making transportation healthful and safe and creating human-scale cities, it may be a bumpy ride in the meantime. This entry was posted in Blog on April 18, 2018 by SABA. 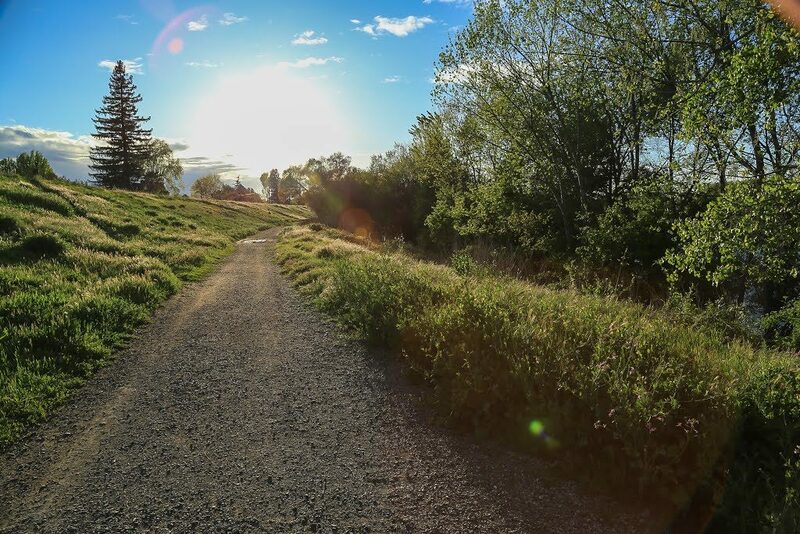 This month the Nest project along the Clarksburg Branch Line Trail in West Sacramento moved a lot closer to completion. 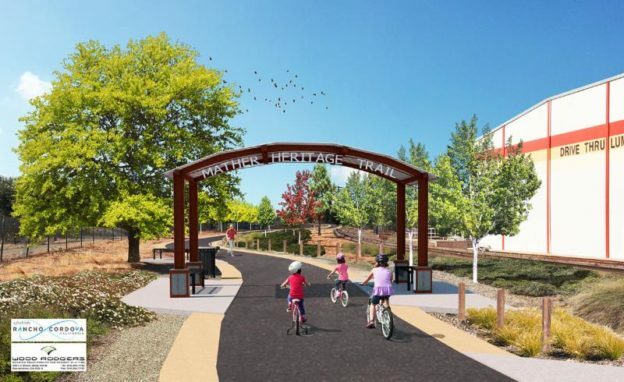 The West Sacramento City Council unanimously approved a license to allow Assemble Sacramento, the all-volunteer organization behind the project, to build the small park improvement for trail users just south of Lake Washington Blvd. SABA is the project’s fiscal sponsor, responsible for processing donations as well as bookkeeping and accounting. The trail runs along the old Clarksburg Branch Line Railroad right-of-way between West Sacramento and Clarksburg. The first 1.25 miles of paved trail opened in 2014. 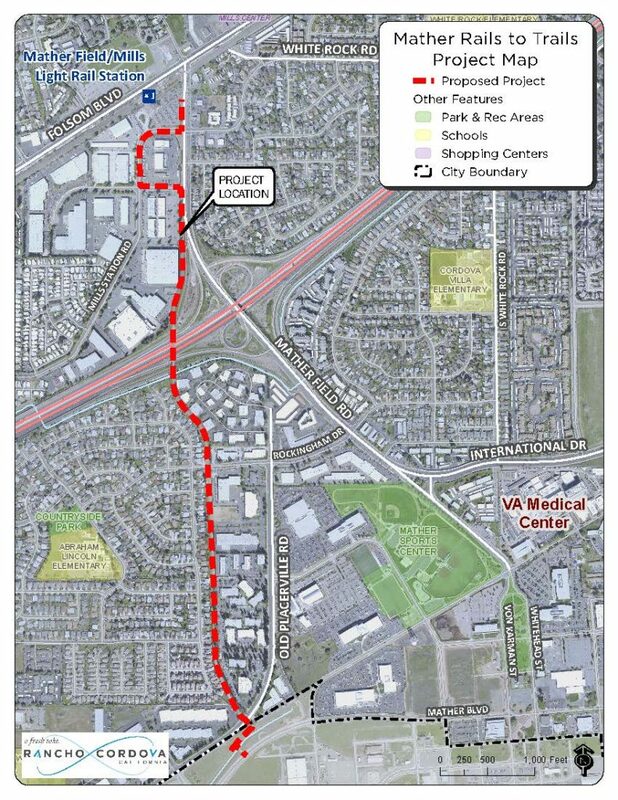 The City of West Sacramento owns the entire right-of-way all the way to Clarksburg, and is currently seeking grant funding to pave more of it. The Nest will be a fenced enclosure with several small tables and fixed chairs, a shade structure, water fountain and landscaping. The name and design are meant to recall the habitat of water birds native to the area. 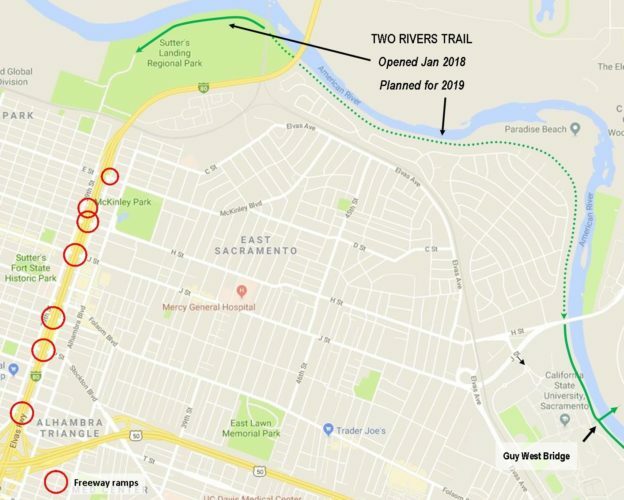 In addition to being the first park improvement along the trail, the project is unique because it will be a public amenity built by the City with funds raised privately by Assemble Sacramento. A similar public-private approach was used to build privately funded playground improvements in the Bridgeway Island neighborhood in West Sacramento. 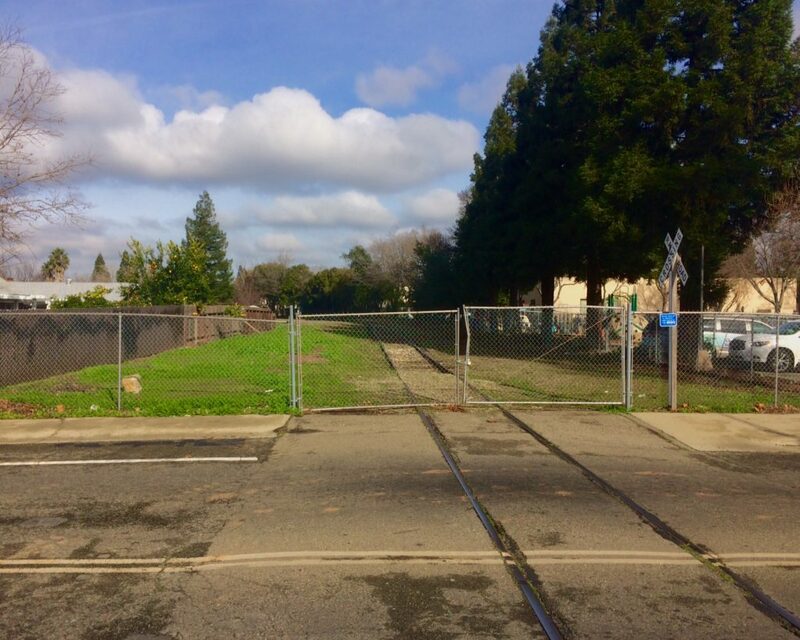 The public-private model enables the City to use public funds for park improvements in underserved neighborhoods in the north part of West Sacramento. We know from multi-use trails around the nation that improvements like this one will attract more people to use the trail, improving its value for recreation, transportation and the environment. And as we’ve seen elsewhere, bringing more activity to this location will make this section of the trail that much safer for everyone. The design of the Nest reflects the principles of crime prevention through environmental design, an approach to facility design that emphasizes visibility, accessibility and activity. Bridgeway Island Park next to Bridgeway Island Elementary School. In response to concerns about the location and design raised by parents of students at Our Lady of Grace School, located across the trail from the Nest site, Assemble Sacramento modified the design and also agreed to pay for relocating school playground equipment away from the trail and building a ball wall and planting trees to block views of the playground. Our region has dozens of public parks located directly next to schools. At Bridgeway Island Elementary School in West Sacramento, a public park facility similar to the Nest is located along the west end of the school’s unfenced playing field. At Blue Oaks Park in Roseville, a branch of the Pleasant Grove Creek Trail runs through at a Nest-like gathering area next to the Blue Oaks Elementary School’s playground. In South Natomas, the Bannon Creek Parkway trail runs directly behind Bannon Creek and Jefferson elementary schools. 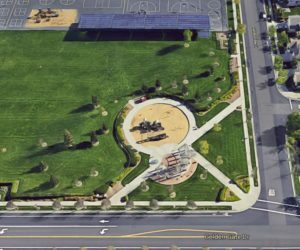 In fact, most of the public parks in South Natomas are located directly next to schools. 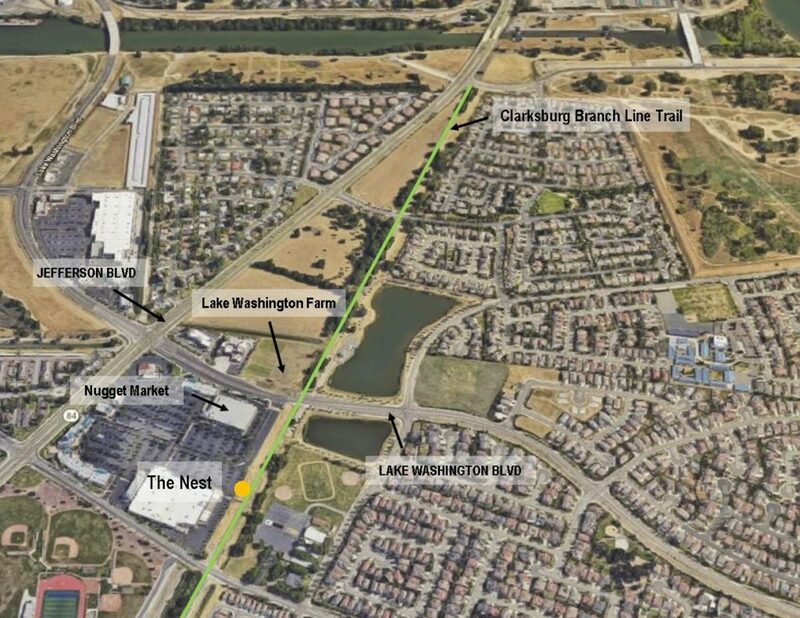 The Nest likely won’t be the only improvement for trail users in this area. 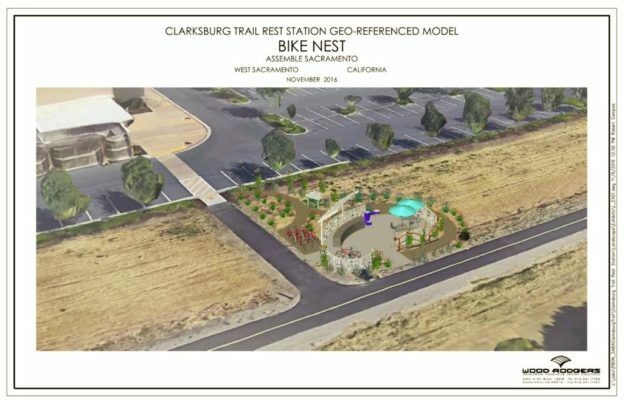 Other groups have proposed installing a rose garden and a picnic area for horseback riders directly next to the Nest site. Equestrians are authorized to use the Clarksburg trail. Two years ago the Center for Land-Based Learning opened the 3.3-acre Lake Washington Farm and farmstand about 200 yards north of the Nest location. 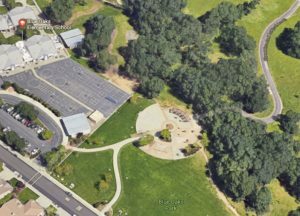 River City High School and neighboring West Sacramento Recreation Center are both located about 400 yards down the trail from the Nest site. This entry was posted in Blog on March 28, 2018 by SABA. The Sacramento region continues to move towards the launch of bike share operations, but the process has not been smooth or without surprises (hint: get ready for shared e-scooters). We have a strong interest in the potential of bike share as a means for replacing car trips with bike trips: fewer car trips means cleaner air for everyone, while more bikes on the road improves safety for all roadway users. The rapidly evolving model for delivering bike share, including shared mobility devices other than bikes, is being felt in our region, as local governments work hard to keep up. Here’s the latest news. On Mar. 21, the Sacramento City Council approved an ordinance that sets standards for bike share businesses wanting to operate in Sacramento, with different impacts on different bike share providers. Sacramento’s new ordinance requires bikes to be equipped with locks to allow locking to a bike rack, a requirement that would force operators like LimeBike and Spin, which only deploy self-locking bikes, to redesign their bikes in order to qualify for an operating permit. To prevent bike share bikes from displacing personally owned bikes from bike racks, bike share businesses must provide 1.5 public bike parking spaces (usable by anyone) for every bike they deploy. The ordinance also prohibits any bicyclist from leaving a bike where it prevents pedestrians from passing through (this applies to personally owned bikes as well as share bikes). 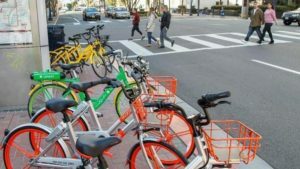 This provision is meant to head off the kinds of problems experienced in places like Washington, D.C, Seattle, Dallas and most recently Coronado, CA, where business and property owners increasingly see self-locking bike share bikes as a public nuisance. 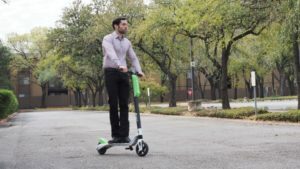 The ordinance also covers shared electric scooters, the newest form of shared mobility technology, and similar shared devices. Providers of shared e-scooters would have to meet all the requirements for bike share businesses. Sacramento will also require electric bike share bikes to be equipped for a maximum operating speed of 15 MPH. 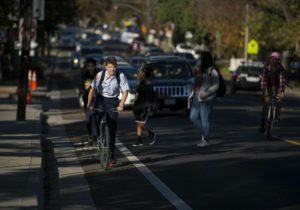 Sacramento is the first U.S. city to impose such a cap, although some European countries have capped e-bike operating speeds at 25 KPH or about 15.5 MPH. The City justifies the cap as a safety feature, however, there is little research to demonstrate the link between e-bike operating speeds and safety. 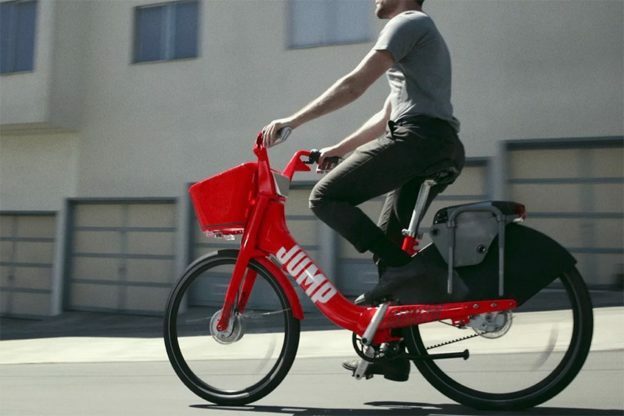 This requirement will impact JUMP Bike, operator of the SACOG regional bike share system that will launch North America’s largest electric bike share fleet in Sacramento, West Sacramento and Davis this spring. At our request, the City agreed to revisit this provision in a year, once data is available about usage, speeds and crashes. We respect the City’s safety concerns and also want to ensure that City policies are based on data, evidence and best practices. Last month the cities of Rancho Cordova and Folsom both issued permits to allow LimeBike to begin operating this spring. And then on Mar. 19, LimeBike announced that it was backing out, citing the impacts of Sacramento’s bike share ordinance. LimeBike told the cities it had counted on operating in the urban center of Sacramento as the way to make its suburban operations in the east county succeed – which was news to both cities and stakeholders, as LimeBike hadn’t previously stated its intention to operate in Sacramento. Bike share systems typically succeed in denser, more urbanized neighborhoods that can generate enough ridership. We haven’t seen evidence from other cities that entirely suburban settings, like Rancho Cordova and Folsom, can support bike share operations. Early this month, West Sacramento issued a permit to LimeBike to deploy 100 e-scooters in the riverfront area near City Hall and Raley Field. LimeBike currently operates its Lime-S e-scooters in San Francisco, San Jose and San Diego. 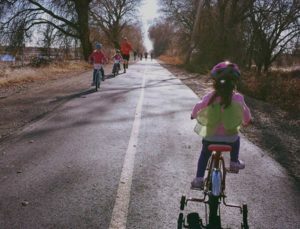 State law allows them to be ridden wherever bikes can operate, including bike lanes and off-street bike paths, but not on streets with speed limits over 25 MPH that don’t also bike lanes and never on sidewalks. Riders must be 16 or older, have a driver’s license and wear a helmet. With very few e-scooters currently being operated in the region, it’s hard to predict the actual impact of LimeBike e-scooters on bicycle transportation, however, we’ll track the roll-out in West Sacramento to ensure that e-scooter users don’t impede trips by bike. Sacramentans on bikes can probably expect to encounter a few Lime-S e-scooters ridden across the Tower Bridge into downtown Sacramento, even if LimeBike doesn’t have a permit to operate there. But if an e-scooter customer ends in Sacramento and leaves the scooter there, Sacramento has the authority to impound it. This entry was posted in Blog on March 22, 2018 by SABA. 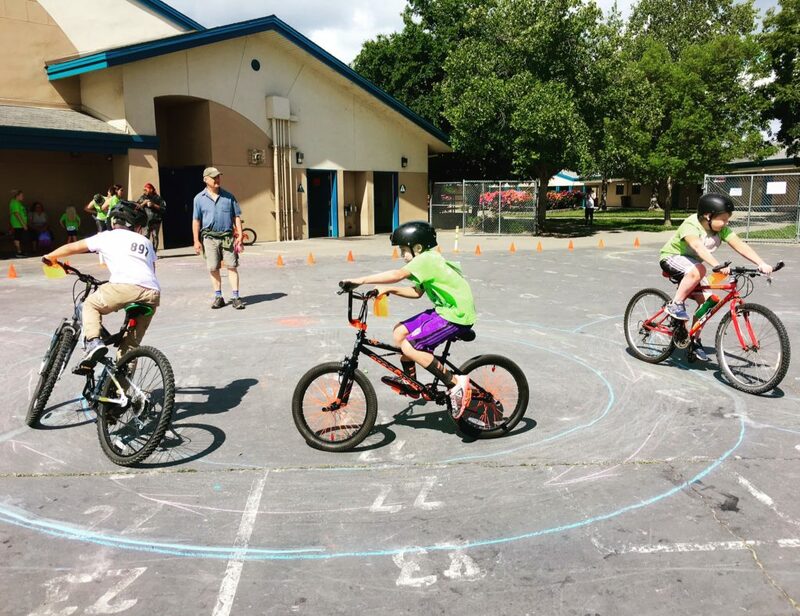 Starting next week, the City of Sacramento will host four community workshops to present its draft plan for implementing the recently updated Bicycle Master Plan. The workshops will also include the City’s draft Vision Zero action plan for preventing severe and fatal traffic collisions. 3425 Martin Luther King Jr. Blvd. at 8th Ave. The City completed the update of its Bicycle Master Plan in 2016. The draft implementation plan, completed as a separate project, sets priorities for meeting the Bicycle Master Plan goals of increasing the number of people on bikes, making bicycling safer, creating continuous, connected networks of bike routes, and ensuring that future improvements are made equitably throughout the city, including in historically underserved neighborhoods. SABA successfully pushed the City to add these goals to the Bicycle Master Plan during the update. 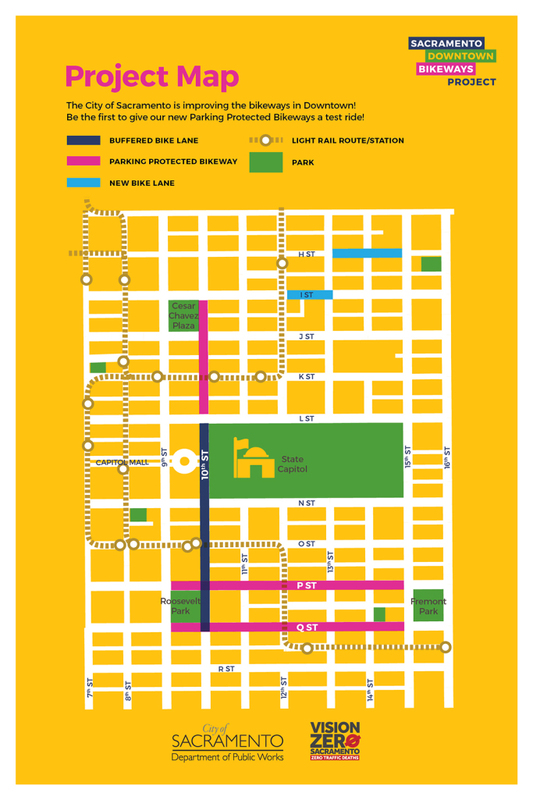 Weighing factors such as cost and difficulty, as well as the historical pattern of under-investment in neighborhoods outside the Central City, the implementation plan assigns priorities to all of the projects currently proposed in the Bicycle Master Plan. Meanwhile, the draft Vision Zero action plan contains the proposed steps the City will follow to achieve the goal of safety, based on data about the location and type of past traffic collisions. The City has set the ambitious goal of eliminating severe-injury and fatal collisions of all types by 2027. The draft Vision Zero plan also directs the City to develop strategies for educating road users about risk factors, enforcing speed limits and laws against driving distracted and under the influence, and creating a culture among City agencies that makes traffic safety a top priority. SABA is part of a task force of community groups and agencies asked to contribute to the content of the City’s plan. Together, the two plans will determine what kinds of improvements will be made on which streets, and sets spending priorities based on safety. 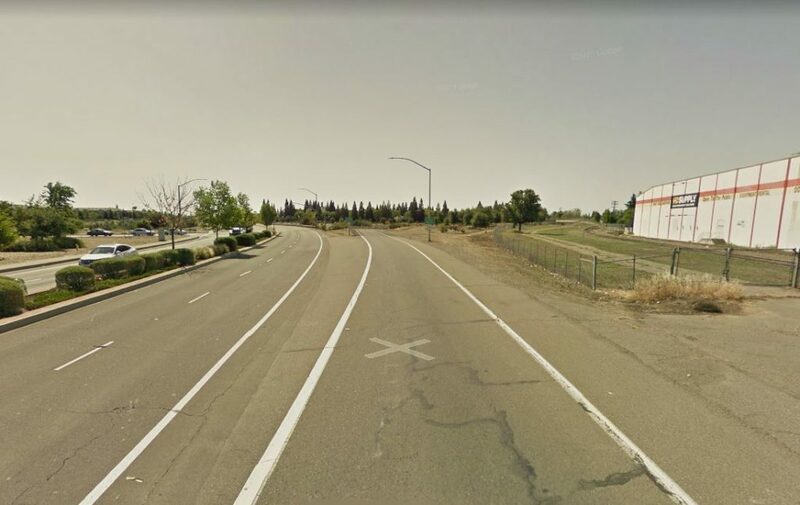 The two plans could result in residents of historically underserved neighborhoods, especially in South Sacramento and North Sacramento, seeing increased City investments to improve roadway safety. Feedback received from residents at the upcoming workshops will help the City finalize the draft plans, which will be presented to the City Council for adoption later this spring. Effective advocacy is only possible with your support. To make a tax-deductible, year-end gift to SABA right now, please click here. This entry was posted in Blog on January 11, 2018 by SABA.